A year-and-a-half ago, an old friend found me on Facebook and offered me a writing job and participation in a podcast. I took him up on both. Mark Linsenmayer and I had been graduate students in philosophy at the University of Texas in Austin, but we both left before getting the PhD to try our hands at something more practical. Mark suggested we make that experience the theme of an ongoing philosophical discussion: we loved philosophy but preferred it as an avocation. There was something about the professionalization of philosophy that seemed to go against the spirit of it. 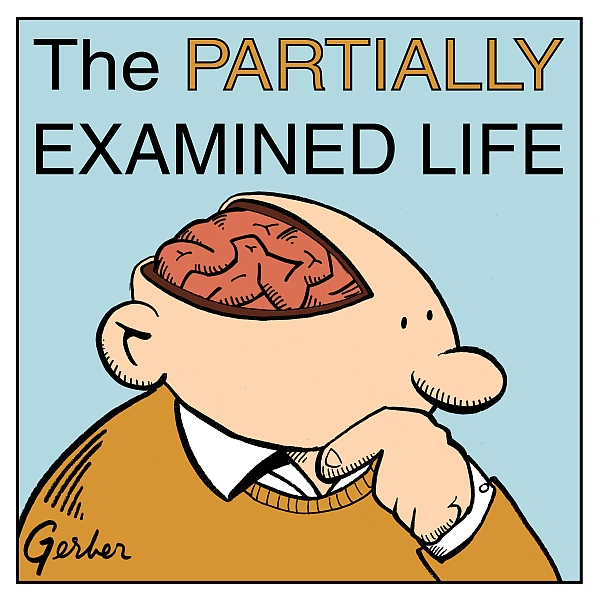 We preferred the “partially examined life” to the examined life. May 12 was the one year anniversary of our first episode. During that time we’ve covered topics ranging from Plato’s conception of the examined life to Nietzsche’s immoralism, God and faith, to the philosophy of mind. Frankly I’m always amazed that there are people who want to listen to three guys talk about these things, but we seem to have a chemistry that works. One review—for better or for worse—pegs Mark as “the Jack Black-like musician,” Seth as the “sad one with calm voice who usually guides the rudder of the conversation back into the topic,” and me as “avuncular and wry.” We’ve also received a lot of great reviews on iTunes, and a thrilling compliment from philosopher Arthur C. Danto, who was gracious enough to listen to our discussion of two of his essays in The Philosophical Disenfranchisement of Art. We’ve been gratified to see our listenership rise, but most importantly we’re happy that the podcast has kept us connected to philosophy and allowed us to pursue it—partially—in a way that seems more compatible with the spirit of the discipline. This post comes to us via Wes Alwan, an occasional contributor to Open Culture. I’m a huge fan of The Partially Examined Life, and I’m glad to see it get some publicity here!! Great work Mark, Wes and Seth. Thanks Lucinda — much appreciated! Sweet! I’ve been looking for something to complement the excellent Philosophybites podcasts. @Samson — yes, we’re deep in the haystack, and I’m not sure how to change that. @Greg: then you’re a true philosopher. I love you guys. Loved the discussion on Derrida and Lacan. I am a psychoanalyst and I enjoyed the struggle proving that we are only human! Lacan is really obscure. I cant believe you are part of the PEL podcast, ive been a constant follower of openculture as well as PEL without knowing they had this link. interesting. thanks for all the fulfilling lessons.